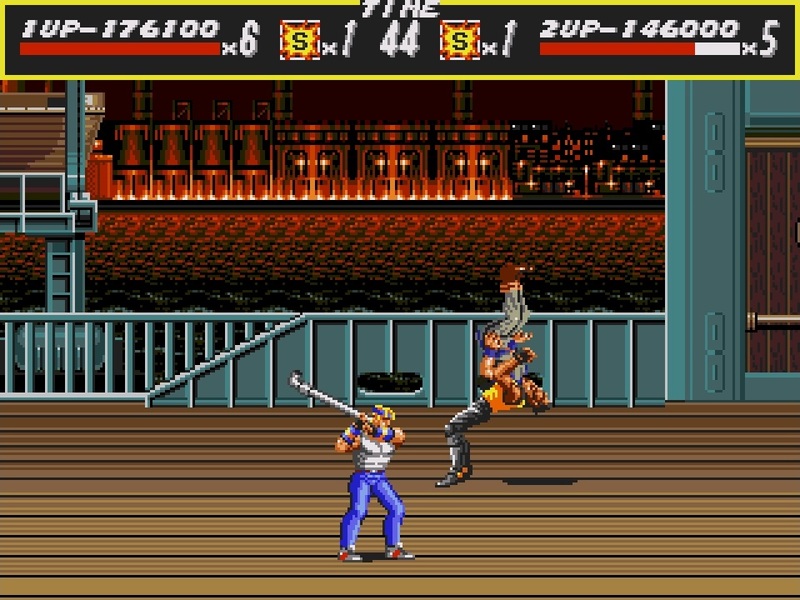 Within a decade of Streets of Rage’s 1991 release, the presence and popularity of the roaming beat ‘em up genre had all but disintegrated, ruthlessly cast aside in the wake of the 3D revolution. Yet somehow, all these years down the line, the same streamlined, magnetically addictive gameplay that came to define a genre near-on twenty-five years ago, remains as bright as the day it swaggered on to the Mega Drive. With every passing year, it seems inevitable that those once-handsome features should dissolve, leaving only a caricature of a brawler, to be remembered chiefly as a means of measuring how far gaming has come since. Even as a new breed of revivalists join the fray, SEGA’s veteran inexplicably continues to hold off the young pretenders. 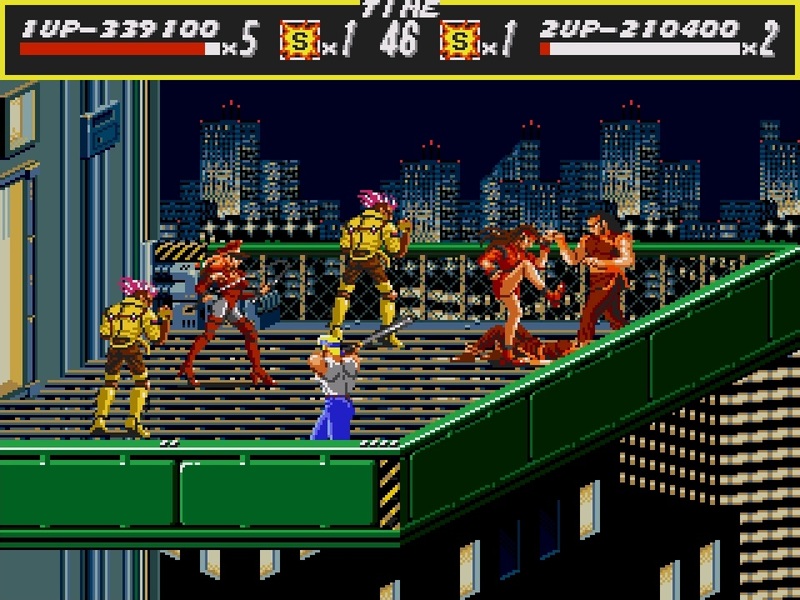 Scott Pilgrim, Charlie Murder and Double Dragon Neon have all benefited from significant technical advances and the never-to-be-understated power of hindsight, but none have rekindled the magic of Streets of Rage. It’s stood the test of time in more measurable terms too. Few games warrant a top score for longevity; fewer still that can be played start-to-finish in less than an hour. But then, as I’ve tackled the memorable journey down the years with neighbours, friends, siblings and partners, it’s hard to shake the feeling that, when you’ve come to measure a game’s shelf life not in hours but decades, you’ve something truly priceless on your hands. Here’s what you need to know: the streets have fallen under gang rule, three plain-clothed police officers (Adam, Axel and Blaze) must battle their way through eight ferocious stages in order to stop Mr. X and his criminal dreams casting a pall over the city. 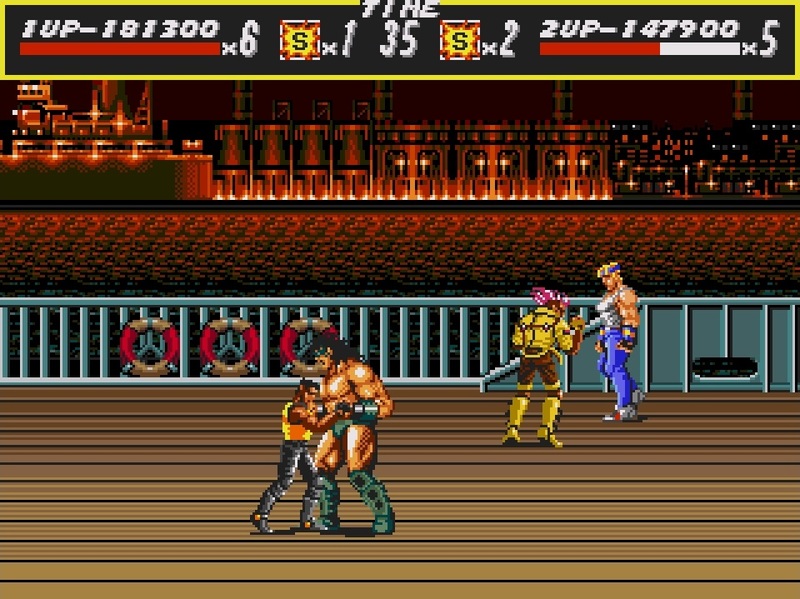 Borrowing the street brawler template from Final Fight, SEGA capitalised on Capcom’s lukewarm SNES port, which was missing a level and, more significantly, two-player co-op, by building a scintillating 16-bit exclusive that perfectly encapsulated what a cooperative gaming experience should embody. Teamwork and coordination is a necessity; deciding who should take that all-important health replenisher, or extra life, how best to nurse a wounded buddy through an enemy-packed section. And, of course, finding the best means of avoiding each other’s fists. Thanks to some memorably challenging bosses and endlessly satisfying, challenging levels, all the trials you clear mean that, by the time you reach the Stage 8 boss rush, the journey has felt like a real team effort. Of course, this would have all seemed academic had the game not have played brilliantly. 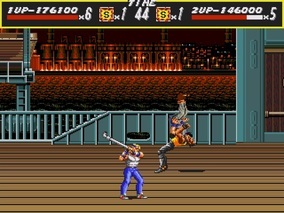 Fortunately, Streets of Rage benefits from superb, razor-sharp controls, and a combat setup that’s instantly accessible. Like the best configurations, the attack/jump buttons reveal a surprising diversity of moves that are satisfying to use and, refreshingly, place primary importance on timing and hand-eye coordination to get the most from them. Chucking a hapless goon back over your head for instance is marvellous, and doubly so if, in doing so, he happens to take down a string of his own allies, or end up down a pit. So often a blight of similar games, the automatic grapple upon contact with a foe is rock-solid, and has arguably never been bettered. 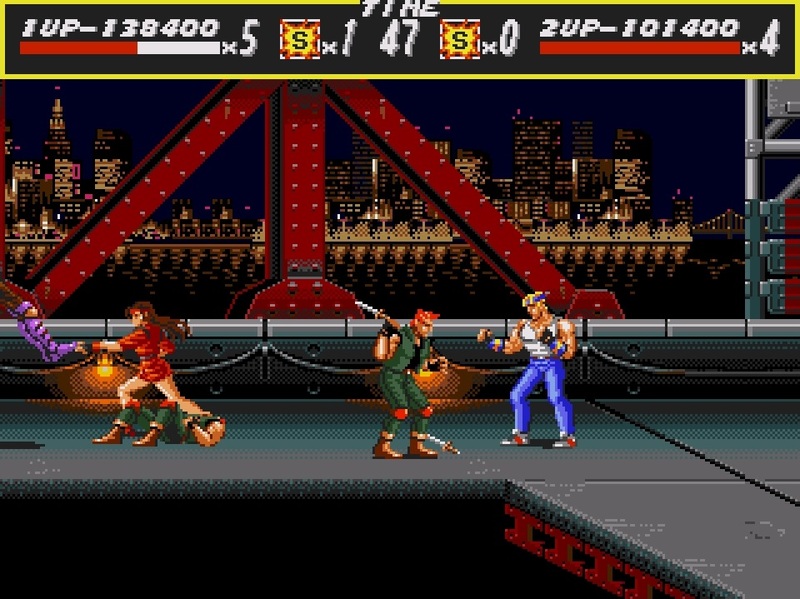 This shouldn’t be understated; getting characters to connect on a 3D plane is notoriously hit and miss (the genre struggled significantly on PSone with this very issue), but Streets of Rage gets the contact physics down to a tee. This is where smart level design comes into play. Every level offers something different, but equally enthralling to tackle. It’s the subtle manner in which the enemies and the challenges evolve as you progress that’s really impressive. There’s a couple of industrial-themed levels that see the player having to be mindful of pitfalls that are all too hungry to claim the lives of careless players, and huge pressers that threaten to squash you flat if you don’t dive through at the right moment. SOR isn’t a killjoy though, and it gives the player as much of a chance to utilise these contraptions as the CPU. The elevator level, so often aped but never bettered, is a cramped, breathless encounter that sees wave after wave of foes descending on you, but nothing beats flinging hapless goons clean over the sides. The bosses are great fun to duel with too, with a memorable mix of dangerous adversaries. Whilst the boomerang-wielding Antonio and massive wrestler Abadede can be vanquished with a bit of pattern-learning, there’s a few real troublemakers. Southern is a vicious early opponent, with a raking attack that isn’t always easy to predict. If he’s tough, then Mona and Lisa, essentially palette-swaps of Blaze, can be a nightmare; let them get near you and you’ll find yourself being hurled through the air, whilst their busy, non-stop movement and flurry of flying kicks makes them a pivotal encounter, especially on the harder skill settings where the bosses can ruin you in no time at all. Whilst its sequel would ramp the presentation up to eleven with its large, sumptuous sprites and silky-smooth scrolling, it’s worth remembering that the original was also a fantastic-looking Mega Drive game. 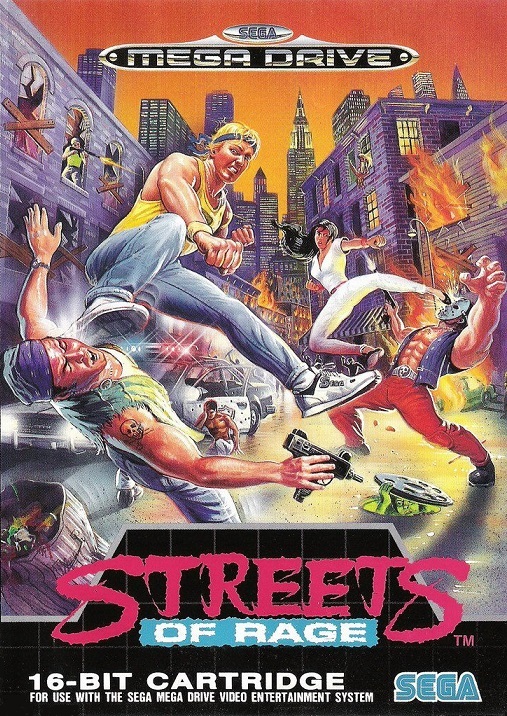 The punk/street gang theme owes a lot to Double Dragon and Final Fight, but Streets of Rage is dynamic enough to leave its own mark. 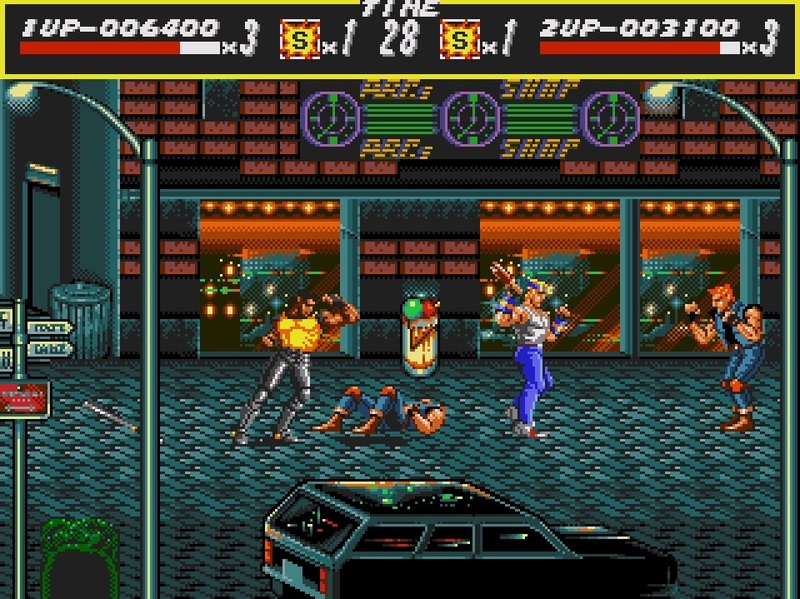 The opening two levels offer a beautiful juxtaposition of a resplendent, neon-drenched city street and an appreciably grimy, menacing slum. From there, you’ve the relatively unusual beach and pier settings amidst some more familiar (though still extremely well-conceived) beat ‘em up fare with a couple of industrial efforts. There’s a decent range of goons and some lovably outlandish animations, with the best saved for the three fantastic central protagonists. 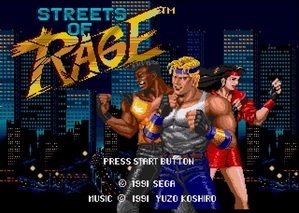 What’s the singular most memorable element of the Streets of Rage experience? 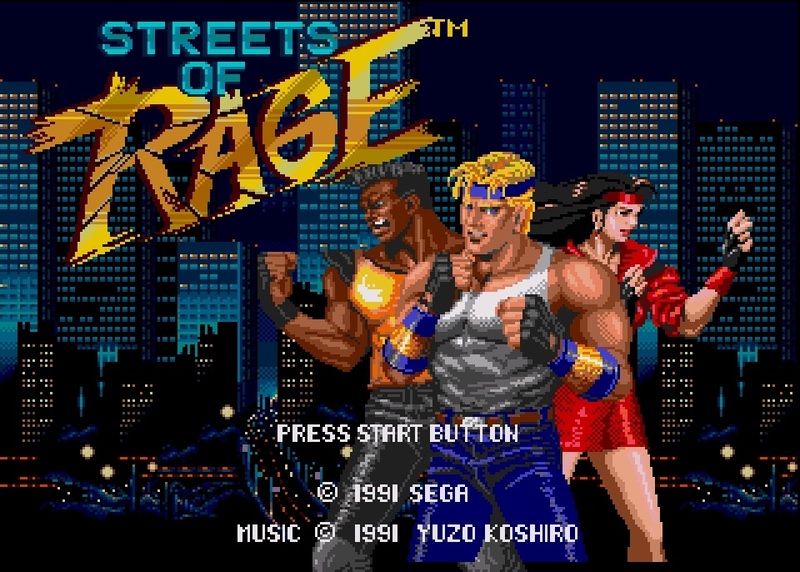 It was, and still is, Yuzo Koshiro’s pulsating soundtrack, which is as synonymous with greatness as the game itself. Koshiro’s progressive fusion of trance, house, EDM and hip-hop made for an unlikely but incredibly effective mix. Frenetic, elaborate compositions injected swagger and urgency in equal measure, but it was the risky (at least in 16-bit chiptunes) prominence of heavy percussion that not only pays off, but comes to feel like the lifeblood of the experience – the driving force behind SOR’s pacey gameplay. “The Last Soul”, which accompanies the game’s outstandingly atmospheric boss-rush final stage, has to be among the greatest songs ever to have appeared in a video game. Crisp menu jingles compliment crunching blows, swooshes and groans to round off what is an aural masterclass. 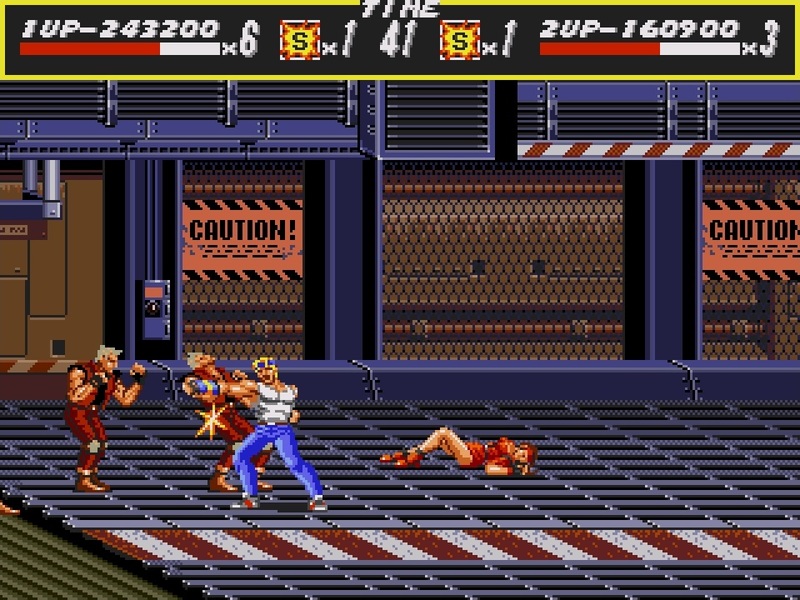 Streets of Rage is a definitive Mega Drive game. Its funky soundtrack and edgy stylings not only delivered SEGA a hugely noteworthy exclusive, but in doing so, one of the most enduring and enjoyable games of the 16-bit era in its entirety. 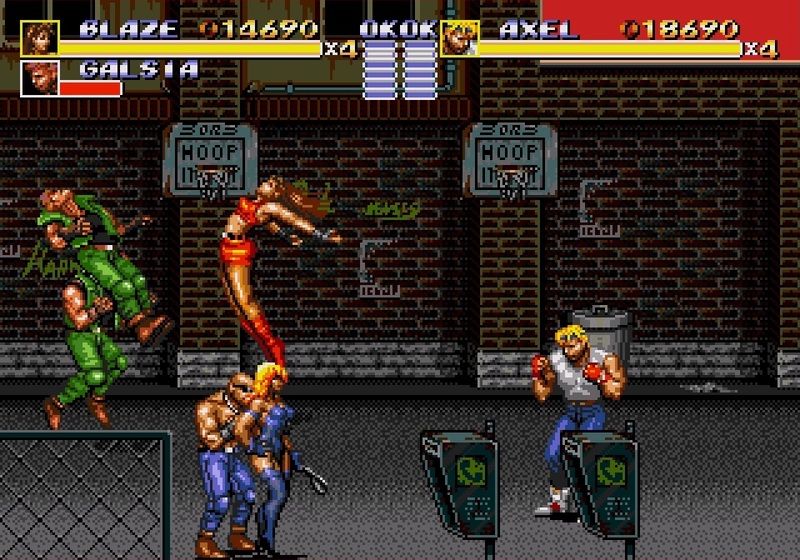 During a time when cooperative multiplayer was sparsely catered-for, Streets of Rage represents a joyous shared experience that is a challenging, engaging, purely feel-good experience that everyone should play. Twenty years after throwing my first pixel-punch, I still can’t resist the pull of battling through SOR with a buddy. I truly believe the same will be the case in another twenty.